Flower Petals Down The Aisle. Gone are the days when the only way you could have flower petals down the aisle was by way of a giggling flower girl. Now, couples are looking at the aisle as another way to add a decorative element to the ceremony. Not only is it the most important walk you'll take, but the options are only limited to your imagination. Embracing the sunlight, this ceremony space is all about brightness. Pastel-colored flower petals aren't just strewn about; they are carefully placed in a swirling fashion at the top of the aisle, flowing all the way down. How perfectly this idea marries with the water in the distance! A variation to this design is to use flower petals in a single color. Here, white petals stand out against the green grass of the ceremony space. Echoing the white chairs for the congregation, these swirls help tie in the entire design beautifully. This wedding is all about color. With a white arbor at the altar, the aisle was splashed with generous amounts of pink petals. The bold color is mimicked in the arrangements at the top of the arbor, as well, for a seamless, yet striking look. In an outdoor ceremony boasting notes of romanticism and softness, the aisle is covered with soft-colored petals. Placed in no particular shape or style, the carefree placement of the petals is perfect for the outdoor occasion. Ombre color trends are in and this aisle takes it to a whole new level. 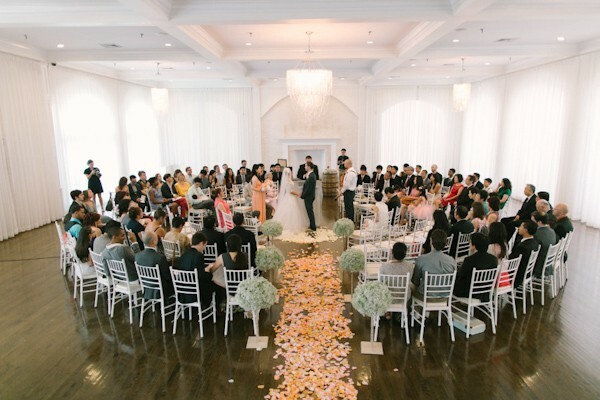 With petals in various shades of pink, orange and white, the designer sprinkled the aisle in an ombre fashion. When the bride hits the aisle, she is walking on pink but by the time she gets to the altar, it's white. How fun! A great opportunity to add a splash of color to a dark floor or ceremony space is to incorporate flower petals in the aisle, as seen in this indoor wedding. A wooden floor is accessorized with white chivari chairs for guests and pink petals are scattered liberally to add just the right amount of color. This wedding features a white aisle runner down the grassy ceremony space. To increase the elegance, the couple adds a heavy layer of red rose petals down each side of the runner. The same flowers are incorporated on their white fabric arbor, as well. The white and red offer an amazing contrast to the space. This aisle is framed with white rose petals down each side of the aisle, with white chairs for the guests and a lovely swag of flowers hanging from the tree. It's a simple way to supplement grace and style into a ceremony space. If you love flowers but don't want to spend a fortune on decor, or if you just want to add a little more appeal to the aisle, flower petals are a great way to decorate. Think about what you want that all-important walk to look like and seek out a florist that can share in your petal point-of-view.